When cooking meats in the shabu-shabu or hot pot style, the quality of the meat will truly shine through. 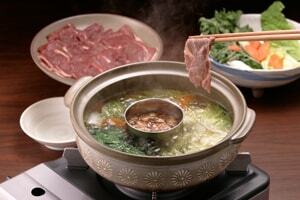 Fine cuts of premium beef, pork and lamb will make your hot pot or shabu-shabu meal a delicious experience. For the moist, delectable taste that defines shabu-shabu or hot pot meat, the meat must cook very quickly, and therefore must be sliced extremely thin.